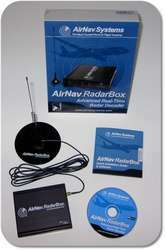 The Radarbox is a receiver for Mode-S/ADS-B beacons of commercial airliners, sent on 1090MHz. This beacon transmits data like position, flight level, identification and other information of the aircraft. With the supplied software the received data is displayed on the PC in tabular and graphic format, showing the current traffic situation of the region. The max. distance up to which an aircraft can be monitored is approx. 400km, but is strongly influenced by local circumstances like obstructions etc. The Radarbox is connected to the PC with an USB cable, i.e. the computer must support USB (1.1 or 2.0). The supplied software works with most Microsoft Windows™ OS from Windows XP and newer, Windows 7 works fine. Windows 2000 requires a free patch downloadable from Microsoft. Earlier versions of Windows and other OS (*nix, Mac OS) are not supported at the moment. The antenna connector on the Radarbox is SMA, the supplied antenna comes with 3m cable. Others antennas can be used as long as they are suitable for 1090MHz, e.g. scanner antennas like discones or active antennas. The supplied magnet base antenna performs best when installed on a metallic surface, a small disc is included for that purpose. The received data is displayed in tabular and graphical format. The table shows identification, nationality, callsign, position, ground speed, heading, rate of ascend/descend and many more. 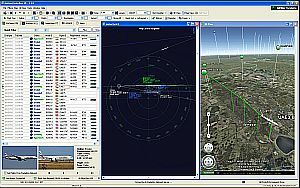 The graphical map displays the position and tracks of aircraft together with selected data for each a/c. Descents/Ascents are coloured differently, representing an up to date situation of the regional airspace. Various zoom levels allow detailed display of smaller regions, e.g. a nearby airport. The supplied CD-ROM contains a lot of other geographical informations, like boundaries, waypoints, airports etc. The supplied data cover the entire world and can be easily extended by the user (simple text format). A very interesting highlight of the Radarbox is the (voluntary) live network of all Radarbox users worldwide. 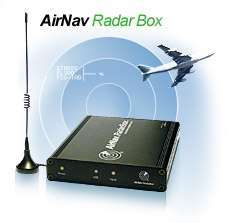 With this network every Radarbox user not only sees the aircraft received by his or her antenna, but also the data of all other users currently online. This service is free for one year after purchase, after that period it becomes an optional subscription service. The price for this subscription is not set yet. The installation is really simple: install USB drivers from CD, attach the Radarbox to PC, attach antenna to Radarbox, install user software from CD - done. The power supply of the Radarbox is done via the USB connector, ideal for portable use with a notebook. Alarm possibilities by E-Mail, SMS, sound signal on approach, appearance of a certain aircraft, aircraft type etc. Different colored symbols for ascent, descent etc.